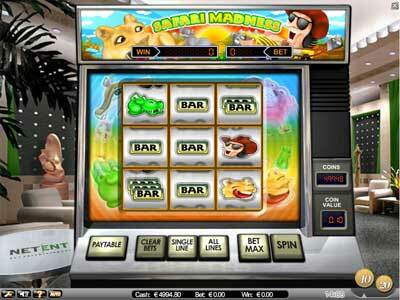 The Safari Madness Fruit Machine is based on an animal safari theme using popular safari symbols like the hippopotamus, crocodile, lion, giraffe, a hunter, car and a bear. The ‘Tourist’ is the scatter symbol. The scatter symbol does not follow any payline and whoever gets 2-9 scatter symbols is paid according to an extra in the paytable. Despite appearing to have only three reels, the game has actually nine independently spinning reels. The game also comes with an auto play control and the ability to instantly stop the reels spinning by hitting the Spin button while they are in motion. The game is played using coin sizes of either 10p or 20p and offers a maximum jackpot of 192,000 coins. Conclusion: Safari Madness far from being the innovation of the century but it is still a very entertaining slot machine with nice features, not too high stakes and decent wins.